If you are looking for a lighter style meal but still filling, this is it. Travels well too if your going to a picnic or need to bring something for a delicious potluck. Seafood lovers will go for seconds with this shrimp filled pasta dish! 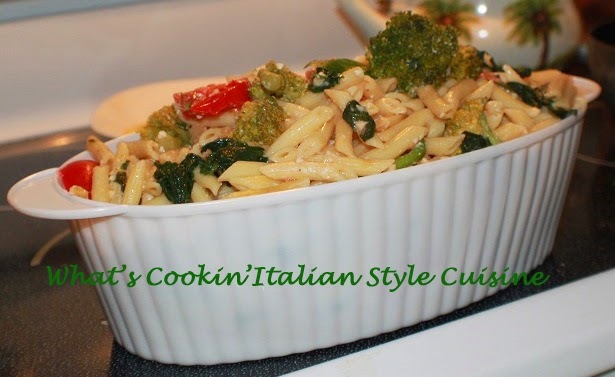 If you love pasta with vegetables and seafood this is the summer meal for you! Optional additions: sliced peppers, black sliced olives, sliced onions can be added with the tomatoes. Cooked Pasta boiled in salt water to package directions. In a large fry pan, add 1/4 cup olive oil, garlic, broccoli florets and spinach. Saute until spinach has wilted. Add the white wine and tomatoes. Cook for around 8 minutes. In the meantime boil your favorite pasta ,( penne pictured) and set aside. Add the shrimp to the pan and cook until the shrimp turns pink, around 4 to 5 minutes. Add the fresh herbs and stir. Mix drained pasta with shrimp mixture and serve.